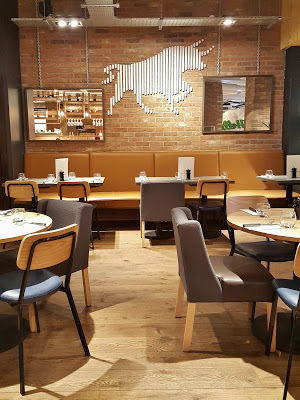 Following on from my blog post on our micro break in Birmingham, I wanted to share with you our amazing meal at Bar + Block Steakhouse in the city centre. 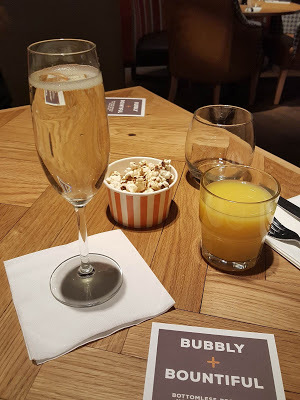 We were invited along to try out their new ‘Bottomless Brunch’ which includes unlimited prosecco, hot drinks and juice for £15 for 90 minutes when you order any dish. Although the restaurant looks like a trendy independent restaurant, it is actually part of the Beefeater Grill chain, although it had a better menu and generally a much warmer atmosphere. The space is nice and large and airy with funky furniture, and I loved the bare brick walls and simple decor. We were seated by our lovely waiter in a cosy booth table behind the bar in the middle of the restaurant and we were given a little tub of popcorn which was a cute touch. The waiter kept our glasses topped up with prosecco, and as part of the Bottomless Brunch deal you can also go up to the drinks station and help yourself to the juices on offer or the coffee machine. 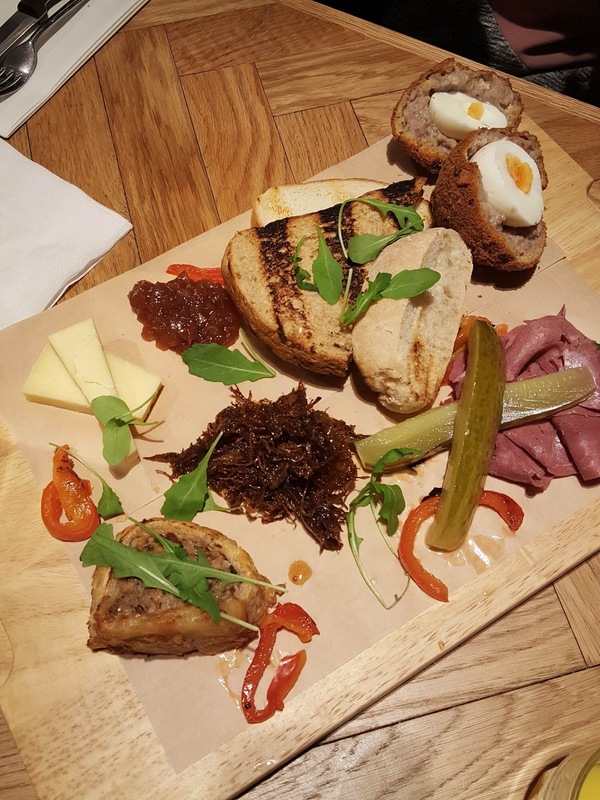 To kick off our meal we decided to share the highly recommended Ploughman’s Block which is basically a sharing board with lots of delicious finger foods including a homemade Scotch egg, sausage roll, cheddar cheese, salt beef, pickles, chargrilled red peppers, pulled beef (my favourite! ), onion marmalade and crusty bread. This was the perfect way to start off our meal and we thoroughly enjoyed trying a little bit of everything, and it was beautifully presented on a thick wooden block. The menu at Bar + Block mainly consists of various meats and steaks, although there are a few vegetarian options available. 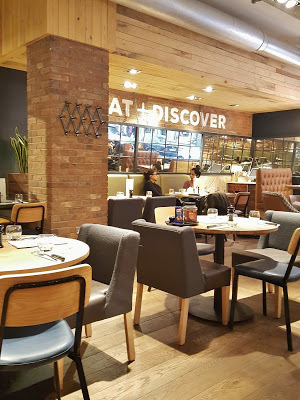 We both decided to order the Butcher’s Block for our main course, which is their special cut of the day, and on our day of visiting the cut was a massive T-bone steak! Yum! This was served along with beef dripping chunky chips by standard, although I opted to get regular French fries. 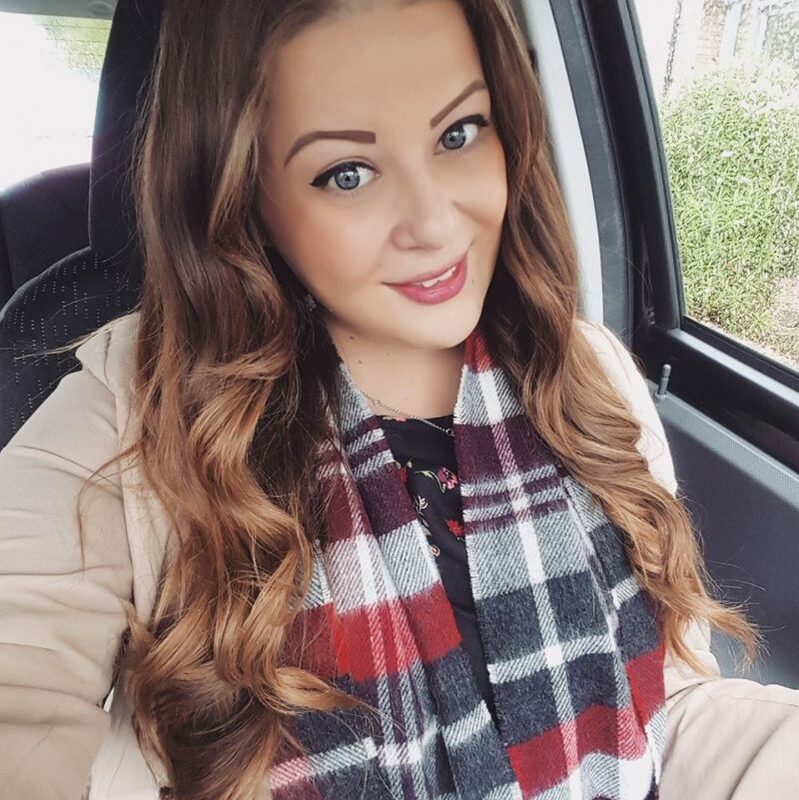 The steak was definitely the biggest I have ever eaten, and it was devine! 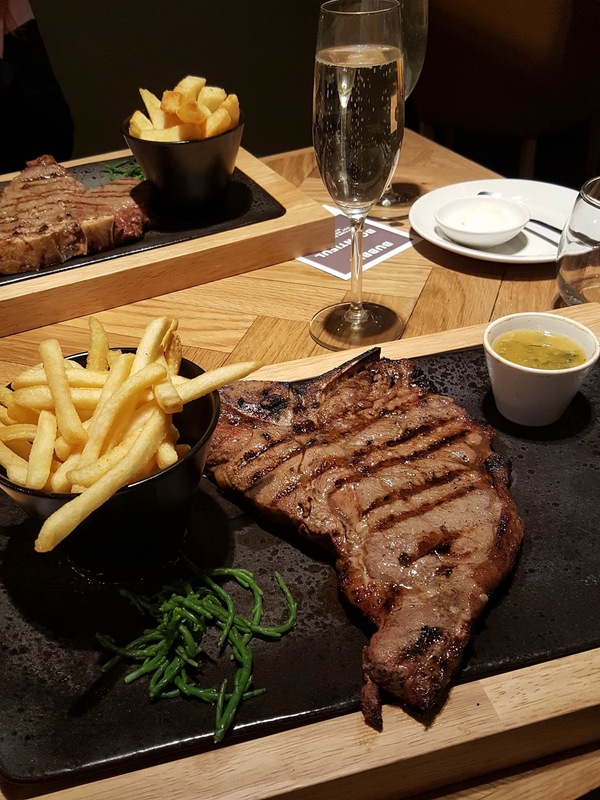 On one side of the bone was a piece of tender fillet and on the other side was a piece of flavoursome sirloin steak and it was grilled to perfection. 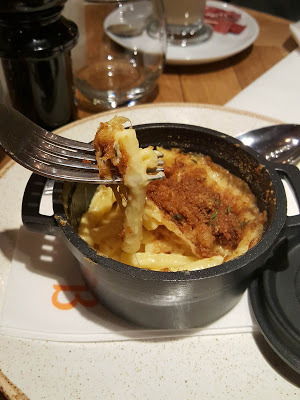 I also could not resist ordering a mini side of mac and cheese which was served in an adorable little pot and had a delicious crispy topping and plenty of creamy cheese… mmm! 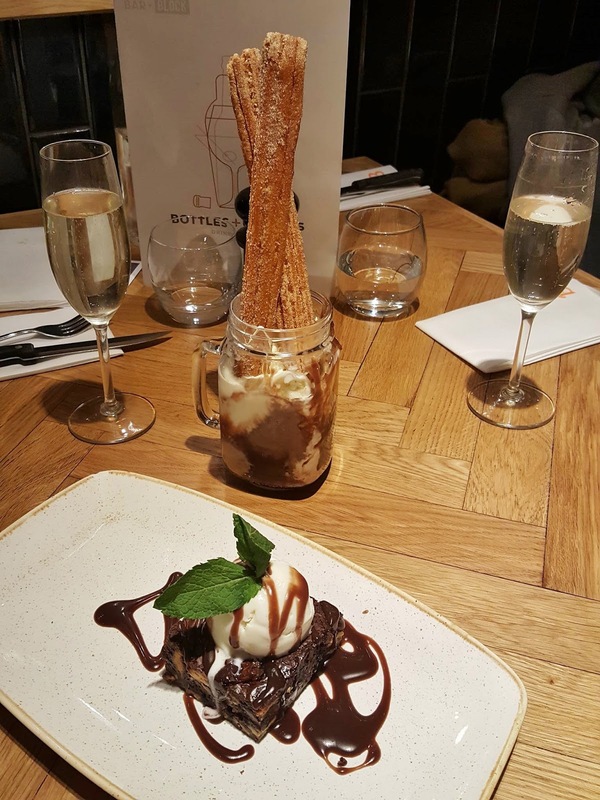 After having such an enjoyable starter and main course I thought we had also better give the dessert menu a try.. and it did not disappoint! 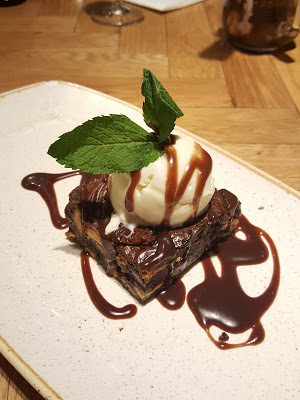 I opted for the Triple Chocolate Brownie which was served warm with chunks of chocolate throughout and topped with chocolate toffee sauce and vanilla ice cream. This is possibly the best chocolate brownie I have ever had (and I’ve had a lot of brownies in my time..). Often when you order a brownie dessert in a restaurant it comes out all crumbly and dry and not really very nice. But I was so in love with this gooey chocolatey piece of goodness I cannot wait to go back and try it again! Terri went for the Churros Sundae which included two big churros coated in cinnamon sugar and served with vanilla and chocolate ice cream, brownie chunks, biscuit bites, clotted cream and chocolate toffee sauce. 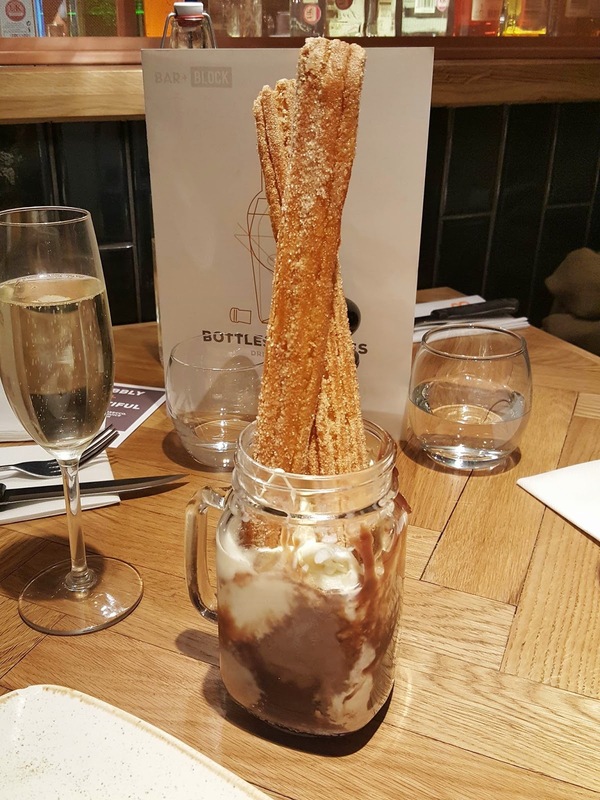 I absolutely love the way that this was presented in a little glass mason jar, it was very instagrammable! In our 90 minutes of the Bottomless Brunch we managed to down 3 glasses of prosecco and 1 orange juice each, which isn’t bad for the £15 price tag of the drinks, although I’d only really recommend this if you plan on having more than 4 glasses.We really enjoyed all three courses of our meal and the staff were brilliant at keeping our drinks topped up and bringing us the beautiful and delicious food. I would thoroughly recommend giving Bar + Block a visit and I plan to return very soon! I love a bottomless brunch, the food looks AMAZING.